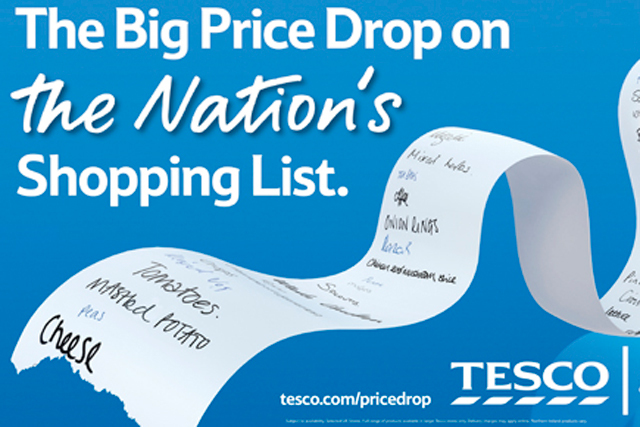 UPDATE - Tesco is slashing prices on 3,000 products and scaling back its promotions as part of its 'Big Price Drop' campaign, which launches next week. Tesco is pouring £500m into the initiative, which it claims is based on listening to the views of 200,000 customers and studying their shopping behaviour through their Clubcard data. The supermarket chain says that it will end its double Clubcard points promotion in four weeks time in order to free up funds for the investment in the Big Price Drop. Tesco UK chief executive Richard Brasher said: "We're giving customers a more straightforward shop - reducing the number of promotions and putting the emphasis on clear and reliable savings that everyone can benefit from. "To ensure we make the biggest change we can for customers, we're going to make a change to Clubcard, ending the double points promotion and returning to one Clubcard point per pound spent. "Clubcard is an important thank-you for customers. They enjoy being rewarded for their loyalty with Clubcard points they can spend later. But they're saying very clearly in these difficult times, that they also want more immediate savings at the checkout. The retailer says the majority of the £500m investment is being spent reducing prices on over 1,000 Tesco own-brand products and claims many of them will be over 50% cheaper than brand equivalents. Rival Sainsbury's has hit out at the new Tesco campaign, labelling it "classic smoke and mirrors from Tesco, giving with one hand and taking with the other." The statement continued: "Removing double Clubcard points will save Tesco £350 million. It is no surprise to us that Sainsbury’s price match policy, together with a stronger own brand offer, has forced Tesco to take this kind of action." Tesco has internally been planning a reduction in promotional activity and re-investment in everyday lower prices for a number of months. Information about the campaign from city analysts sent down the share prices of Sainsbury’s, Morrisons and Ocado yesterday. Ocado's shares were hit the hardest, due to the online grocery retailer’s Tesco price-match promise, which pledges to match Tesco on household branded goods. The news comes the week after Sainsbury’s unveiled its new "live well for less" positioning, which will see the supermarket accentuate value in order to appeal to consumers in straightened times. The new Tesco strategy will bring it closer in line with Asda, which has an everyday low-prices proposition. At the beginning of the year, Asda introduced a guarantee to pay back customers the difference in price, plus 10%, if rival supermarkets were found to be cheaper. Tesco initially responded by saying it would accept Asda's refund vouchers, and then upped the ante at the end of February by pledging to give back double the difference in prices. But in April, it reined back to give just the difference in price, blaming consumers for over-exploiting the deal. Are own-brand products key to winning the supermarket price wars? Should Sainsbury's be trying something new?